CHABARA（ちゃばら）、英語ガイドにも！ - 日本再発見ノート　Rediscover Japan. 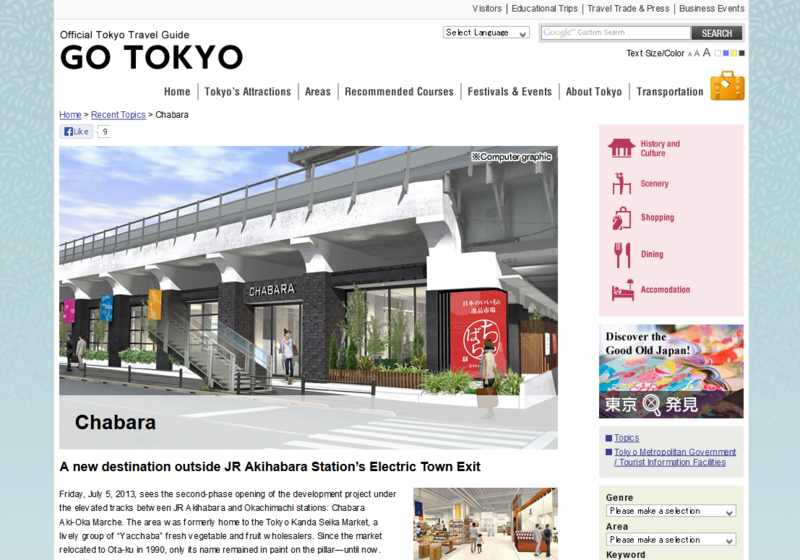 Friday, July 5, 2013, sees the second-phase opening of the development project under the elevated tracks between JR Akihabara and Okachimachi stations: Chabara Aki-Oka Marche. The area was formerly home to the Tokyo Kanda Seika Market, a lively group of “Yacchaba” fresh vegetable and fruit wholesalers. Since the market relocated to Ota-ku in 1990, only its name remained in paint on the pillar—until now. Chabara revives the energy of the past in a facility dedicated to promoting Japan’s food culture. Tenants include the Nippon Hyakkaten store dealing in foodstuffs available nowhere else in Tokyo; Yanaka Coffeeten, which roasts several dozens of varieties of raw coffee beans on the spot; and Komaki Shokudo—Zen Cuisine Kamakura Fushikian, which serves dishes prepared to bring out the best of the ingredients and seeks to inject fun into the daily ritual of eating.